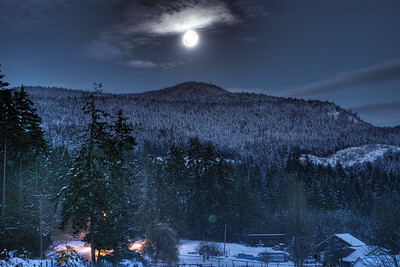 A full moon looks over the moutain that Chief Tzouhalem lived in a cave in after difficulties with local settlers. He is the most famous local Chief in the Cowichan Valley area after confronting the local settlers in Victoria. The winters first snow fall blankets the mountain in a light powder and the light reflects to create a most beautiful scene. This high resolution HDR image would make for a perfect print or card.